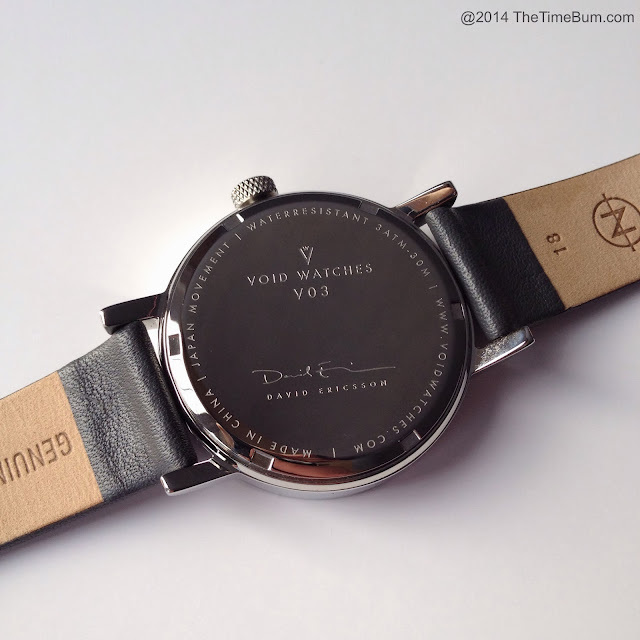 Swedish designer and Hong Kong resident David Ericsson launched Void Watches in 2008. 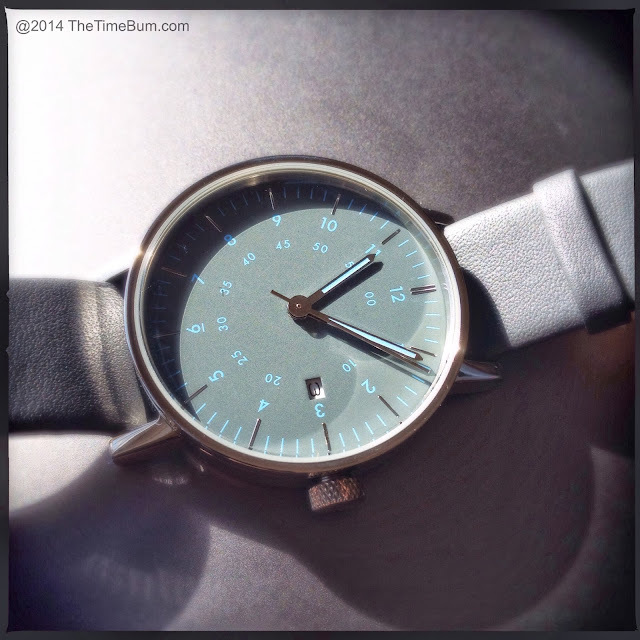 The line includes digital, quartz, and automatic watches with a Scandanavian modernist aesthetic. As Ericsson describes it, "Our design philosophy is to create unique products using as simple geometries as possible and bring them to life using honest, traditional materials." The results are inventive, effective, and most important to The Time Bum, quite affordable, like the $215 V03D reviewed today. The price includes international shipping and a 2-year warranty. The V03D (V03D-PODGGB to be precise) is a three hand analog with a date function. The polished stainless steel case is 38mm wide and 10mm thick with a slim bezel and mineral crystal. Movement is a trusty Miyota quartz but Void does not specify which one. As is true of most inexpensive quartz watches, the second hand lands somewhere between the markers. Water resistance is a mere 30m, so it is best to keep it out of the pool. The slim lugs hold an unadorned 18mm leather strap that tapers to a polished 16mm buckle. The case back is polished and engraved with Ericsson's signature, surrounded by basic specs and the Void URL on the perimeter. I like the fact that all surfaces are polished, not just the parts that are visible when worn. A push-pull crown sits at 3:00. It is large and knurled, offering a curious contrast to the highly polished case. Both the buckle and crown are engraved with the Void logo. 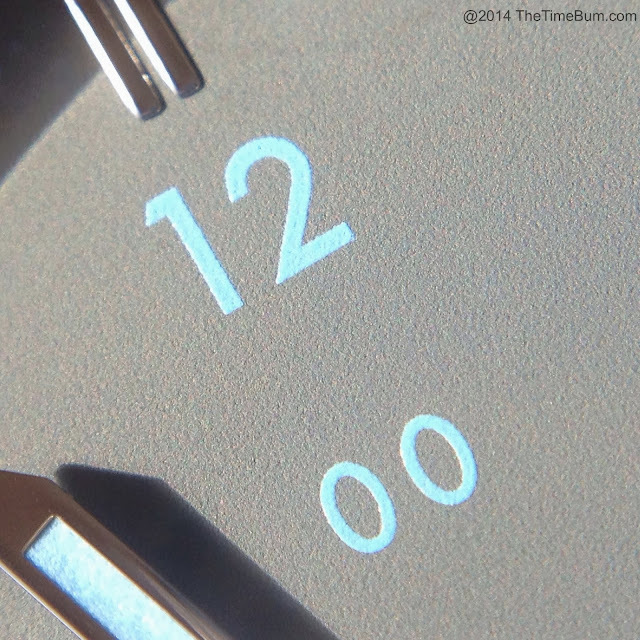 The dial is dark grey with both polished and blue printed elements. The straight hour markers are applied and polished, and barely raised above the dial. The indicies between them are printed. The dial layout is vaguely military, with two sets of Arabic numerals printed in a clean, unadorned typeface in a concentric arrangement. Hours form the outermost ring, while a smaller set of 5-00 in increments of five form the inner ring. The baton hour and minute hands are polished and filled with the same blue paint as the markers. The overall effect is muted, modern, and attractive. The alignment of the numerals is a distinctive touch, and although it means those in the lower half of the dial are upside down to the viewer, this does not affect readability. One the other hand, the blue-on-grey color scheme is not what one would call high visibility, but it is sufficient under most light conditions. Most, but not all. In low light you must rely on the reflection off the polished hands and markers. Failing that, the lack of contrast and illumination make it unreadable. 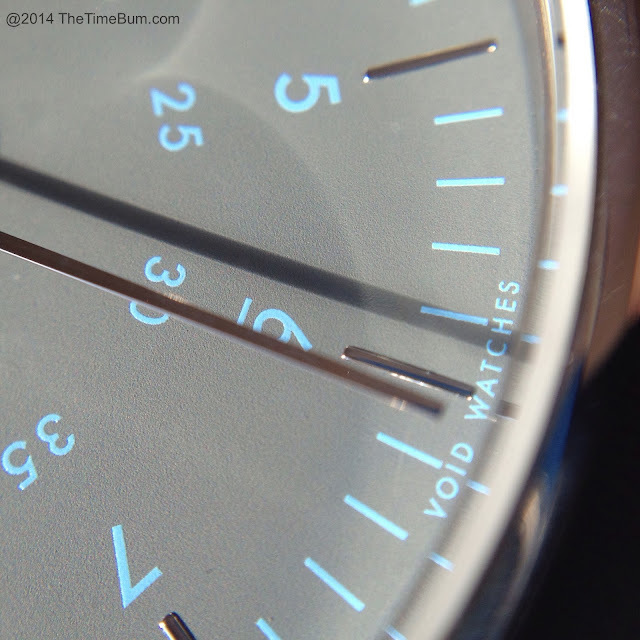 Other versions have better contrast, but in the V03D series, the blue-on-grey is by far the most distinctive. 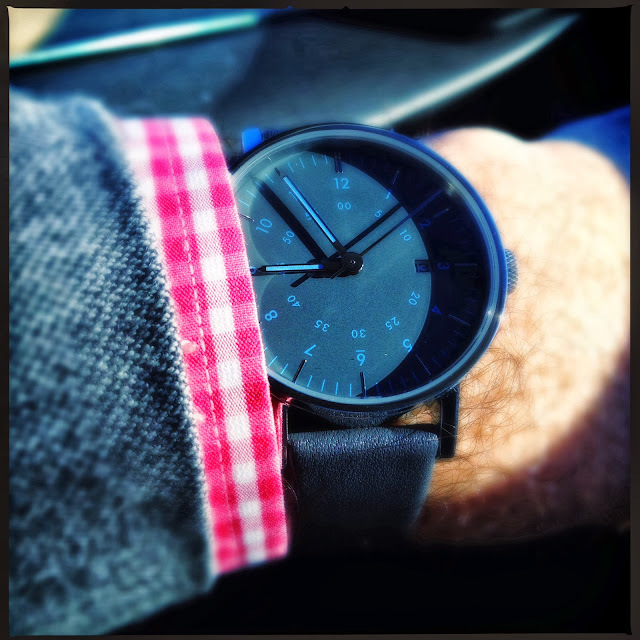 It is not a color combination you will find on many watches, but it is a choice of form over function. The only text or brand identification on the face is and infinitesimal "Void Watches" at the outermost edge of very bottom of the dial. In a world where many manufacturers clutter their dials with rows of pointless text (yeah, I'm looking at you, Rolex), this nearly sterile dial is particularly refreshing. The black on white date window replaces the 15 position on the inner ring. It is the only thing breaking the muted color scheme, but it breaks it in a big way. Every other element is subdued, but the white disk pops out to steal attention from the rest of the dial. It is also the only numeral that appears in a linear orientation, which is made all the more obvious by its position next to the sideways 3. It is a small thing, and I understand at this price point it is not cost effective to print custom date wheels, but I would rather have seen the date eliminated altogether in favor of maintaining uniformity and symmetry. I found the Void to be comfortable to wear and surprisingly versatile. Its modest dimensions allow it to slip easily under a cuff, and the grey color pairs well with clothing on the cooler side of the color spectrum. It is hardly a tool watch, but the knurled crown and vaguely military dial give it a functional vibe that does not look out of place with jeans on the weekend. On the other hand, the muted colors, undecorated strap, and polished case dress it up enough for business casual or even a charcoal suit. Overall, I rather like the V03D. It is smart and stylish with clever elements and uncommon colors. It does not shout for attention, but gets noticed by those who appreciate its subtle, modern design. Pro: Uncommon color and sophisticated style. Con: White date wheel detracts.